Give your friend a meaningful baby shower gift that they will surely appreciate. These gifts will surely be valued and will create a sentimental memory. Baby shower is a special day for parents to create wonderful memories for the parents when the new baby grows up. This day is a day for the mother-to-be and her new baby. It is a day of joy for them. It feels great to be part of this celebration as you share your happiness to the mother in celebrating an addition of new life in the family. Capture this wonderful moment and let it live long. Make this great joy last long by giving her a sentimental gift. Check this list of sentimental baby shower gifts that the recipient will truly appreciate. Mom met Dad and then there was me! This gift idea tells the formula why there will be a new addition to the family. It is where the new parents will be having their first family picture. This new baby will complete their family. Having a new addition to the family is really something great to celebrate and be happy with. The parents will be glad to have something to keep a wonderful memory of their soon-to-be baby. It is something the parents and the new baby can look at after several years. This lovely gift is made from black wood frame with expression made from metal lettering and can hold up to three pictures. It is a wonderful gift idea that captures those special moments. A gift idea that will leave a lasting impression, this will make both the parents and the new baby really happy. This sentimental gift set looks so adorable. This gift set will keep memories that will last long. It is nice to have something to look back to, and this baby photo album will keep all the cute and lovely memories that the new baby will start building. From the baby’s first photos, first hair cut, first day at school and so many memories to save. 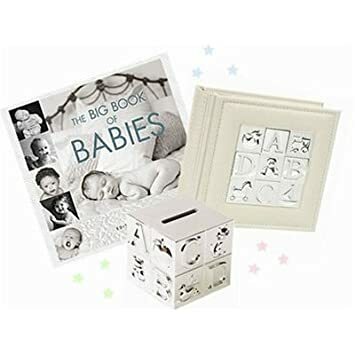 This 3-piece gift set includes an ABC baby album where parents can keep their new baby’s wonderful photos, Big Book of Babies for the new parents to read helping them take care of their new baby, and a silver plated piggy bank to help the parent save extra for the baby’s nursery. All of these gift items come in a beautifully wrapped gift box making your gift look beautiful and adorable. Isn’t wonderful to see that your parents were able to keep your first tooth and first curl? Imagine how this coming baby will feel when one day his parents will show him these cute little memories. He will surely feel the same thing you felt, It is great to know that you will be a part of that memory. This gift idea will keep a treasure that no amount can compensate. Parents of this new baby will surely appreciate your gift. Send your best wishes with this wonderful gift idea that will keep wonderful memories. Let the parents and the new baby have something to cherish and remember. Great pick for a baby shower gift. A sentimental baby shower gift can keep baby’s precious moments. 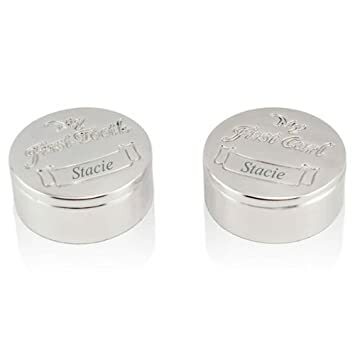 This gift idea is perfect in preserving and keeping the new baby’s future baby teeth. This keeps the new baby’s future baby teeth when they already fallen off. It can be fitted in photo albums and keepsake boxes. Parents will be glad to have a gift where they can keep the future treasures of their new baby. It is a sentimental way of organizing their new baby’s future memories. This gift will surely be valued and loved. This baby shower gift idea is something really sweet and sentimental to share. Both parents and the new baby will love this gift idea. It is something you can’t find easily out in the market. 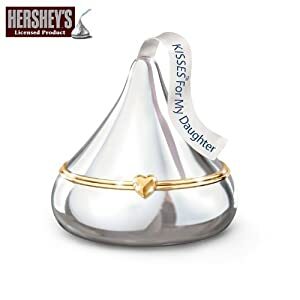 It has this unique Hershey’s Kisses design. This music box is a perfect heirloom from one generation to another. Start the chain of their lovely heirloom. This is a gift that will surely be valued by the parents and the new baby when he grows up. What a sentimental baby shower gift. They will surely remember you and appreciate your gift. Now that there will be a new addition to the family, it is best to have something that will capture the whole family’s smile. This photo collage collection is a perfect gift idea that will create sentimental value to the recipient. This photo collage will show off photos of the whole family including the new baby in a unique style. These cut out frames will surely be a compliment magnet. The new baby’s photo as well as the whole family’s photos will be cherished and bring pride as it hangs on the wall. An expectant mother is nervous and excited to be with her baby. She has this happiness that no one can ever describe. Make this baby shower memorable. Keep the memories of this wonderful feeling with this sentimental baby shower gift idea for the mother. She can have it placed on her coffee table or in her work desk. This unique tumbled marble tile will remind her everyday of how special she is and a great mother she become and will always be. It is even special by making it personalized and exclusively hers. This gift idea is indeed a sentimental one. It symbolizes what motherhood is. It is a beautiful symbol of a loving she will be and will remain to be. A mother’s love will always be there and just like this necklace it displays how mother’s love is. It is a special gift that a wonderful mother and mother-to-be deserve. Having it personalized makes this gift more valuable to the recipient. This is a lovely choice of gift. A lovely reminder of what a mother is. Not all women can bear a child in their womb. It is a wonderful gift that you can carry a child and take good care of this little angel. Not everyone is blessed to become a mother. This gift idea will remind the mother-to-be how blessed she is. This sentimental gift idea makes a lovely decoration in their house. This is indeed a wonderful gift a mother-to-be can have. For me, if there is another word that can describe a mother, it could be the word “Love” because the only person that can give true love is a mother. A child needs not to ask what he needs, a mother knows it even before he say anything. This definition block will move any mother’s heart on how this gift idea defines her as a mother. This can be a beautiful accent on her work table or room. It will always tell her how great she is and be proud of being a mother. Baby shower is celebrated for the new baby and the mother-to-be. This is a way to show them that people who are dear to them are happy and excited to see the new addition to the family. Celebrate life! I’ve never been given a gift at a baby shower.But, if you want to, what about a small falimy portrait of those expecting the baby in perhaps a nice small frame?Very thoughtful of you.